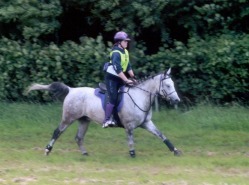 Louise hopes to do a few 160km rides in 2013 and bring the horses on through the senior levels. She may look at going overseas but lets just wait and see. New year, New Season 2010 is here!! Louise is hoping high again this year, she has two of her horses on the British Development Squad one being ridden by her mum Sue Rich, Louise is hoping that these two horses will get their 90km FEI 1* and then go on to get their 120km FEI 2*. Louise has had a fantastic season so far as it is coming to the end of 2009 now. She has won Ludlow Young Riders 80km on Oakleaze Farm Cziko, Oakleaze Farm Czako is now advanced and Oakleaze Farm Czamak is her new novice endurance horse. Louise is going to the Bahrain Dukeries ride to do the 120km FEI*** with Ground Kontrol and the 80km with Oakleaze Farm Cziko and Oakleaze Farm Czako. All three horses performed really well, Ground Kontrol was vetted out at 80km, Oakleaze Farm Cziko passed his 80km and he is now advanced, and Oakleaze Farm Czako completed his first ride and got a Grade 2. Louise is going to MAN 'V' HORSE with Oakleaze Farm Czako for the first time after crewing her mum last year and the year before. 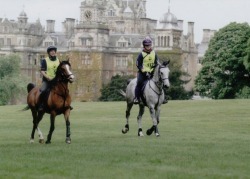 Cirencester Park Louise and Oakleaze Farm Cziko are going to have a go at there first Race Ride together, They did so well and came 4th out of 9 starters. Well done Cziko!